Founded less than a decade ago in 2005, Pinkberry has already captured the zeitgeist, boasting cult-like followers that swear by the chain’s frozen yogurt’s flavor—and by its relative healthiness in comparison to that of more pervasive iced treats. From regular celebrity sightings at West Coast locations to an entire Pinkberry-centric episode of HBO’s acclaimed Curb Your Enthusiasm, the frozen yogurt company has cemented itself in popular culture. It’s all part of the bigger plan, according to Ryan Patel, the director of global real estate and business development for Pinkberry. For himself, for the myriad companies that have employed him, for the people he works with, and for the future leaders he speaks to at US business schools, both work and life are all about growth. Now he’s applying his philosophies to the well-known frozen yogurt brand, and he has already taken it from fewer than 95 locations to more than 250 in 21 countries since he first joined in 2011. He has pushed Pinkberry into new markets by using the skills and lessons he learned from both a worldly business school and the numerous other brands he has worked with since graduating. Recalling his time as an undergrad at the University of California–Berkeley, Patel feels fortunate to have been exposed to not only a diverse student campus but also an educational environment with a global perspective. Courses on Asia and Latin America, while having no direct bearing on Patel’s business degree, laid important groundwork for his current international role. After graduation, he first joined the fast-casual restaurant chain Panda Express, part of Panda Restaurant Group, Inc., where he learned the legal side of the food industry as well as how leases work. “I learned backwards from a normal person,” says Patel, who learned the intricacies of lease negotiations solely through his experience. He saw the outcomes, identified where deals could be improved, and developed a foundational understanding of how to negotiate a lease from its inception because he knew the vision of the end product. From there, Patel went to California-based casual-dining operator BJ’s Restaurants, Inc., where he became more involved with the development side of business, helping put together layouts and pro forma alongside the company’s CFO. When Patel first arrived at BJ’s, it had approximately 30 restaurants and was on the cusp of launching a new prototype beyond the Golden State into Arizona, Washington, Nevada, Colorado, and the west side of Texas. He simultaneously took classes at the University of California–Irvine’s Paul Merage School of Business and helped put together more than 65 new restaurants for BJ’s. He had returned to school to earn his MBA because he felt he was becoming savvier and wanted to further enhance his financial skills. In grad school, he was the only student out of the 54 that were accepted into his class that had worked in his field. And, once again, he was able to take advantage of his peers’ disparate points of view. 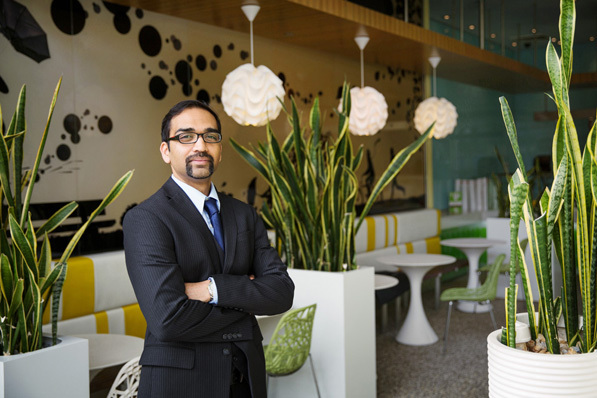 Afterward, Patel was subsequently recruited by restaurant retailer Jamba Juice, his first category-leading brand. The company’s size allowed Patel to quickly get into its systems and understand how to structure a business that has a lot of units. Unfortunately, Patel joined Jamba Juice during the 2008 recession, and he ended up killing more deals than he created, but he did learn how to take a step back and form a new market plan when business isn’t going well. Lastly, before joining Pinkberry, Patel moved into the retail market, joining Wet Seal, Inc. He helped grow the clothier to more than 500 stores while concurrently cutting occupancy costs down. To give the company an edge, Patel has helped Pinkberry create a more flexible footprint that can still employ a full-service model. The brand can now fit locations into stand-alone structures, kiosks, and stores-within-a-store, which allows it to populate both airports and retail giants such as Macy’s. “You have to have the flexibility to create a vehicle to push out there but still be Pinkberry,” Patel says.